Tolkien: Maker of Middle-earth. The Morgan Library & Museum. Photography by Graham S. Haber. My visit to Tolkien: Maker of Middle-earth in New York City was an absolute pleasure. To see another edition of this outstanding exhibition was well worth the trip. What had been changed in comparison to the Oxford edition, the challenges in difference, the opportunities to present differently – all those were questions I wanted to ask John McQuillen, Associate Curator of Printed Books at The Morgan Library & Museum. Could you tell the readers a bit about you and your work with the Morgan and how much work went into the curation of this exhibition? I am a curator in the Printed Books department and focus on the invention of printing in Europe around 1450 with the Gutenberg Bible through the 16th century…basically Renaissance books. I do not work on 20th-century literature; however, my background is in Medieval Studies and Medieval Art History, so I was familiar with Prof. Tolkien as a scholar of Old and Middle English literature rather than through the legendarium. Stepping into the hobbit hole: Tolkien: Maker of Middle-earth. The Morgan Library & Museum. Photography by Graham S. Haber. When the Bodleian Library approached the Morgan about hosting the Tolkien exhibition they were preparing, I was charged with organizing it. The Morgan exhibition is about half of the size of the Oxford version: we have 115 items on display and they had over 200. So I had to make cuts in the Oxford version to fit into our gallery space and exhibition cases. I wanted to keep the overall narrative of the Oxford exhibition, so in many cases it was simply a matter of reducing the number of items: for example, fewer family photographs, but material in the catalogue, such as the fan letters and some items specifically related to Oxford, I cut out entirely. The literary material for The Hobbit, The Lord of the Rings, and The Silmarillion I left relatively intact, and I was even able to add a few items from our own collection and a private collection that were not in the Oxford exhibition or in the catalogue. In reducing the scale of the exhibition, I still had to keep the balance between the man and his work. Our designer, Jeff Daly, and I wanted to give the visitors the sense of stepping into Tolkien’s world, so the gallery design was critical. This is not your typical art museum exhibition, and we wanted to signal that. Jeff came up with the idea of physically using Tolkien’s drawing of Biblo’s home at Bag-end as the entrance portal that visitors walk through…as though they are walking out of Bilbo’s door into Middle-earth. The exhibition is divided into 6 sections, and each section is painted a different color. The color was taken from an object in that section, so the colors are actually Tolkien’s own color choices. Aside from the portal drawing, we had enlarged prints made of 4 of Tolkien’s illustrations that are in the exhibition to help break up the gallery space. 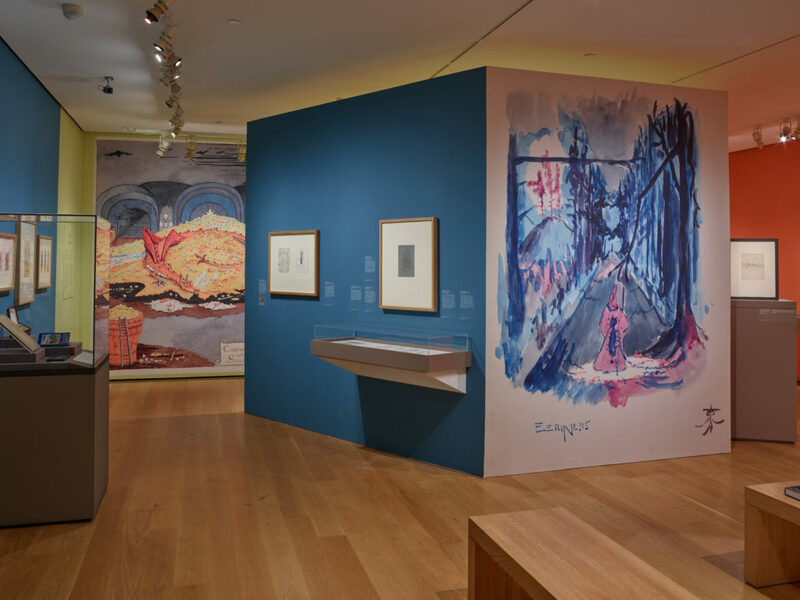 The enlargement of “Conversation with Smaug” introduces the The Hobbit, and two of Tolkien’s drawings from his school days are in the middle of the gallery. 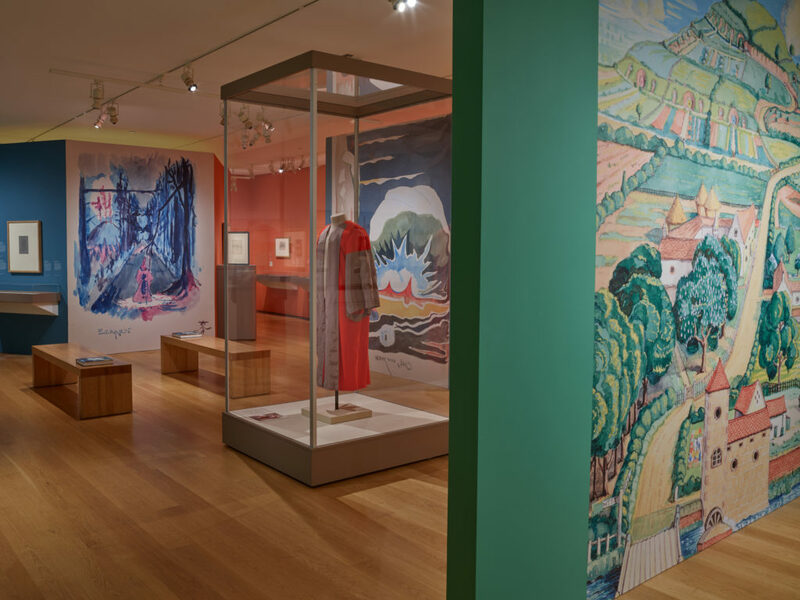 With all of the items in the exhibition being so small–all could be held in one hand–we wanted some large graphics for visual impact and excitement. You have the great advantage – compared to the Oxford exhibition – that visitors can step up really close to the images, maps etc. Also, you chose to present quite a few of the images in very clear frames, cabinets, including very good lighting (again, the Oxford exhibition really kept things ‘in the dark’, so to speak.) What are some of the curator’s thoughts behind those choices? The new Weston Library in Oxford has permanent, large exhibition cases that are designed to be able to adapt to a variety of material. This is both a benefit and hindrance when preparing exhibitions, especially one like Tolkien where all of the material is so small. Each of the Morgan’s exhibitions is designed from scratch in an empty gallery (also a benefit and hindrance). As an institution that straddles both library and art museum, we are well versed in the display of literary manuscript and visual material. The only way to really give the visitor a true appreciation of the material is to let them see it…to get their nose into it, as it were. Framing flat, two-dimensional items, is key, or having shallow, small exhibition cases where visitors can get close to the material. Our light limits are within those safe for fragile works on paper that are liable to fade if shown in too bright of a light. There is something to be said for darker galleries, both for the preservation of the material, but also creating something of a ‘mystical’ aura around the objects; this can be great in Medieval exhibitions or those with metallic material. But if you are looking at text and handwriting, you need to be able to see it. Tolkien: Maker of Middle-earth. The Morgan Library & Museum. Photography by Graham S. Haber. 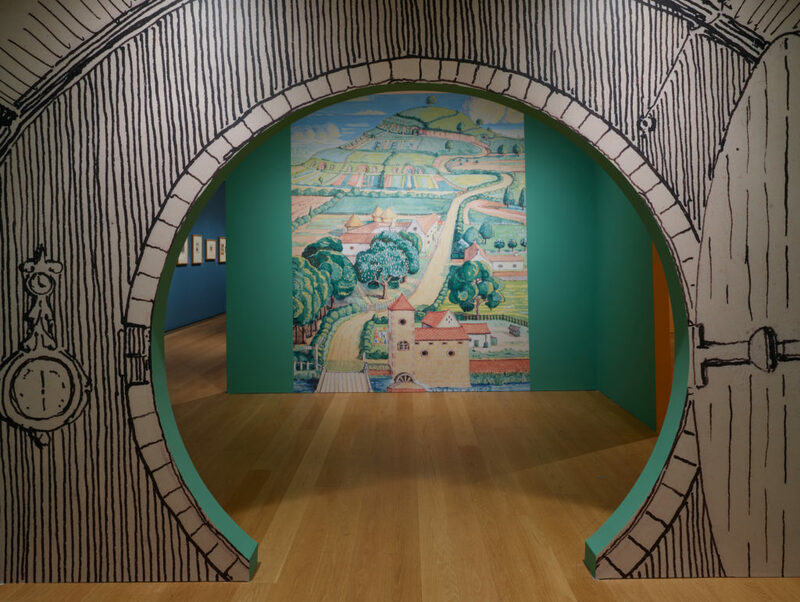 What would you tell Tolkien fans not quite decided yet whether to visit the exhibition why they should most definitely come to New York City and the Morgan? The Oxford/Morgan exhibition is really the only chance to see this amount of Tolkien’s original material exhibited together. The Bodleian and Marquette University Library in Milwaukee, Wisconsin (where the manuscripts to The Hobbit and The Lord of the Rings are housed) have on regular display only 1 item at a time from the their Tolkien collections. And because the material is separated, this is a rare opportunity to see Tolkien’s Lord of the Rings map (from Oxford) reunited with the textual manuscript for Rings and the narrative timeline charts (from Marquette). Fans will get to see this now separated material back together, as it would have been on Tolkien’s desk when he was writing. This is also your only chance to see Tolkien’s letter to Naomi Mitchison from 1954, wherein he answers a number of her questions about the history of the elves, the Blue Wizards, dragons, etc., which helped him form the appendices to Rings. This item is from a private collection and was not in the Oxford exhibition nor in the catalogue. Picture credit: All pictures of Tolkien: Maker of Middle-earth at the Morgan Library & Museum by Graham S. Haber. Used by kind permission. 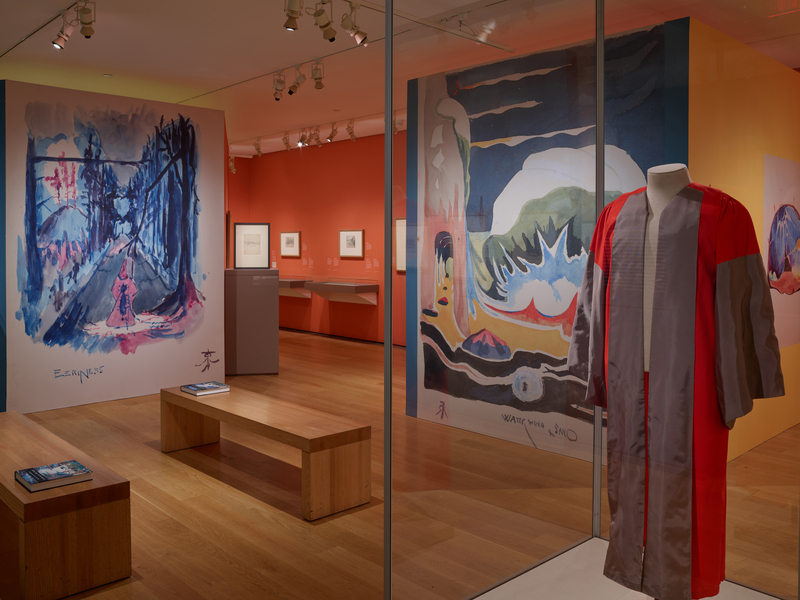 The exhibition Tolkien: Maker of Middle-earth is open until May 12, 2019 at the Morgan Library & Museum. Next story The first image of a black hole – does it look familiar to you?